SMITHFIELD, Va., May 16 /CSRwire/ - Today, Smithfield Foods, Inc. published the third installment of its 2016 Sustainability Report, providing in-depth information about its continued commitment to produce safe, high-quality products. 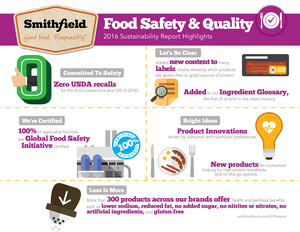 The Food Safety & Quality section highlights Smithfield’s leadership in this area, including recent product innovation achievements and a focus on its companywide food safety culture. Maintaining zero United States Department of Agriculture (USDA) recalls of any food product for the third consecutive year (2014-2016). Expanding its online ingredient glossary, a first for the meat industry that includes more than 100 definitions of ingredients that can be found in Smithfield products. Receiving an American Association for Laboratory Accreditation (A2LA) certification at its Denison, Iowa, microbiology facility — one of only 283 organizations accredited nationwide. Investing approximately $20 million on capital improvements and projects, including upgrading refrigeration systems, enhancing cleaning and sanitation systems and installing new environmental testing equipment. Retaining its 100 percent Global Food Safety Initiative (GFSI) certification, the international gold standard for food safety, at all applicable Smithfield Foods facilities for the fifth year in a row. Innovating with the launch of Smithfield’s antibiotic-free line of pork products under its Pure Farms™ brand, along with many other product innovations. Following the release of the Animal Care and Environment sections, the Food Safety & Quality section is now available at smithfieldfoods.com/food-safety-quality. The last installment of Smithfield’s 2016 Sustainability Report—Helping Communities and People—will be available Monday, May 22, with the complete report.